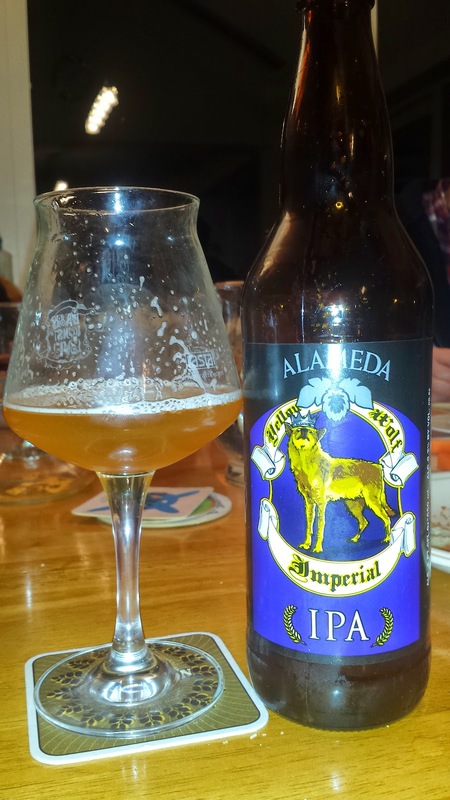 It has been three weeks since I simply wrote about beer I have tasted. I needed to go back to my April notes to pick up where I last left off. I was at a tasting session with TheBeerNut and a few other non bloggers. Here are some of the beers we had that night, the ones worth mentioning. They are in reverse order of drinking. I was very dubious about this Mikkeller beer. 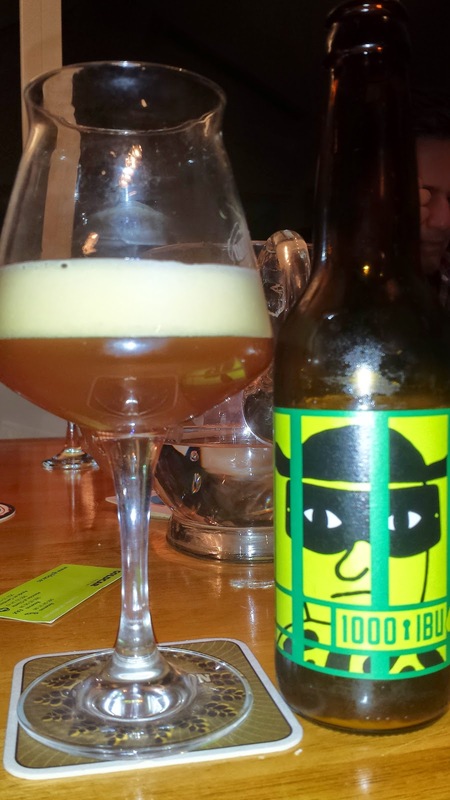 Any beer that claims 1000 IBU can't be taken too seriously. There are two reasons for this. Firstly, humans can't detect anything over about 100 IBU so 1000 IBU is just pointless, we don't even have to get that far because about 100 - 130 IBU is the maximum hop utilisation possible through conventional means. There might be some fancy way of getting more in but not with a typical boil/hop addition method. Perhaps distilling some hop juice or something. So, 1000 IBU is therefore the theoretical maximum via calculations and not what's actually in the beer. That means, there's a lot of wasted hops here. It's probably why the beer is so expensive. We are paying for hop wankery. How's the beer? Well, it's not bad but there's very little going on. It's very bitter (which I love) and that hides any real flavour compounds. It's a little catty and citrusy, that's about all I can say. I wouldn't say it's overpriced cat piss though because I did really enjoy it. I just wouldn't buy it again as it's a gimmicky beer. It was also €7.80 for a 330ml bottle. That sounds like about €5 worth of wasted hops in that bottle alone. From Alameda in Oregon, we have Yellow Wolf DIPA. This is far more my kind of thing. No hop wankery, just plenty of hops, fresh hops at that. A big chewy lemon citrus body that somehow manages to stay crisp and refreshing at the same time. I've had better double IPAs but I wasn't disappointed here. 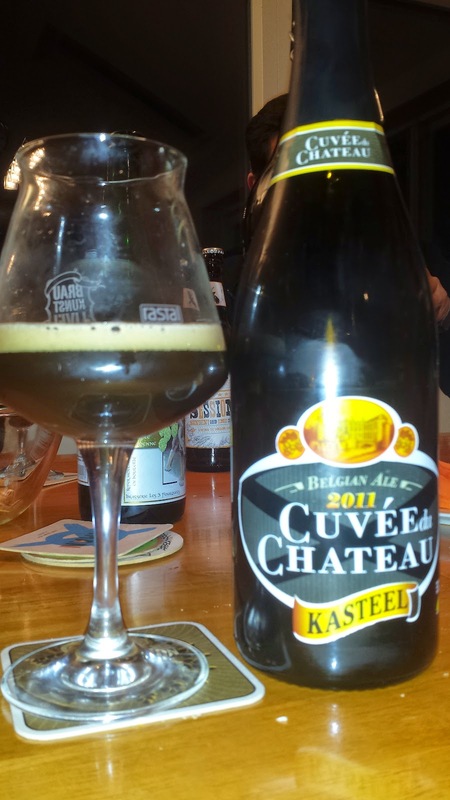 Kasteel Cuvée du Chateau is an immense beer. 11% worth of rum cake and many different dark fruits. There's a lot of sweetness here and I don't go for sweet beers but somehow this just worked. Big, complex and delicious. What more do you need to know? Quite possibly the most expensive bottle of beer I have ever bought. I let myself be talked in to it by the guys at drinkstore. I asked them to convince me and they did, they then said they could close early! 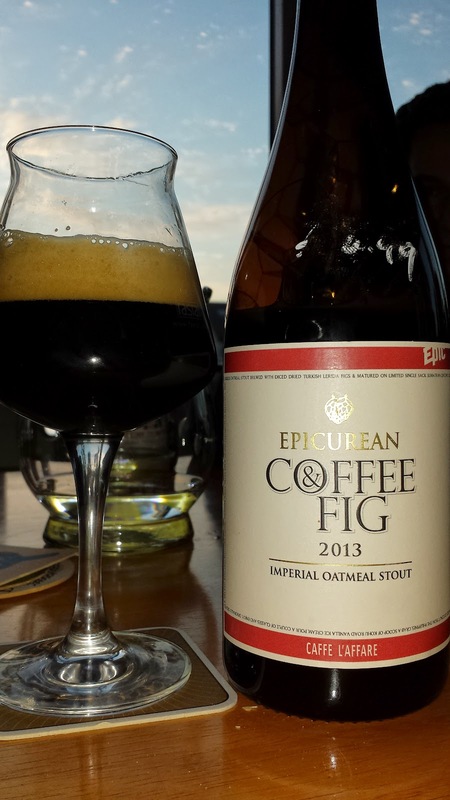 This 750ml bottle of Epic Epicurean Coffee & Fig Imperial Oatmeal Stout cost €25. I bought it as much to support the drinkstore guys as to drink it. I don't drink coffee so it was always one to share. The glass I got was more than enough. The description says it contains caramelised dried Turkish Lerida Figs. Caffe L’affare Ethiopian Sidamo coffee whole beans and Philippine toasted coconut. If I take it just as a beer and not as a beer I paid €25 for, it's pretty good. The coffee is very impressive but not too overpowering. I got a hint of coconut but I couldn't get the figs. The rest of the flavours are normal imperial stout flavours. It's a good beer but not worth €25 a bottle. And the beer that started our session was of course Black's The Session. It's a 3.5% session pale ale that's packed full of hops. There's an impressive amount of fresh hop, citrus and orange pith. I thought the aroma was very similar to Beoir#1, in fact I haven't written about Beoir#1 itself yet, only the brewday. So I will mention Beoir#1 in a moment. The Session is lovely beer, a hint of cattiness but that's fine in a beer like this. I reckon there's plenty of citra hops in this. 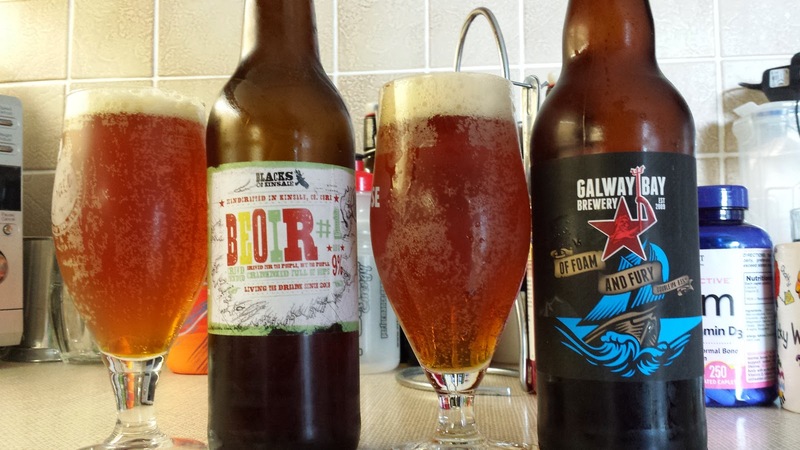 So here is Beoir#1 (brewed at Black's) alongside Galway Bay's Of Foam and Fury. Beoir#1 was to be the first DIPA produced in Ireland but when O'Hara's and then Galway Bay got there before us, OFAF became the one to beat. Beoir#1 (9%): Tropical fruit, huge malt body and great balance. Lovely beer. 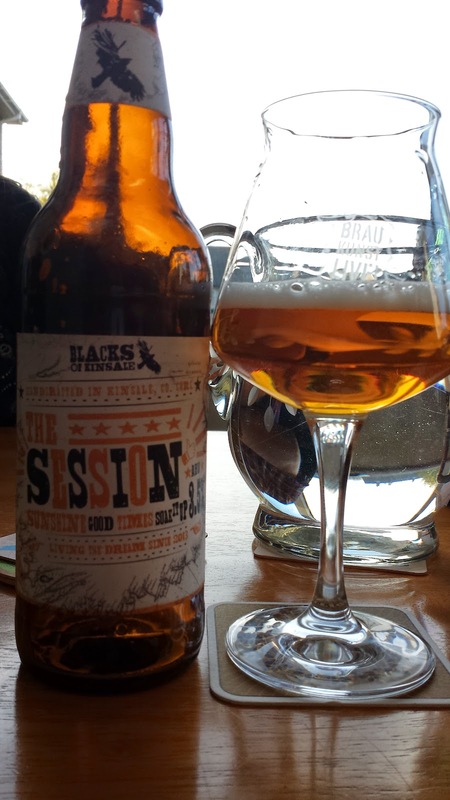 OFAF (8.5%): Much bigger hop oil aroma and flavour. More citrus. It's a little sweeter. Some hop aroma may have been lost due to the bottle being weeks old. Both are great beers but I'm not sure which one I prefer. They are both dangerously drinkable and beautiful beers. I decided to skip the decision and I did a blind taste test on my wife. I didn't even tell her what she was drinking, not even the style. I Just handed her the beers and asked her which she preferred. It was Beoir#1 for her, she found OFAF a little too sweet. Beoir#1 is not available in bottle, that was only for us who brewed it. The general public has been enjoying it on tap at certain pubs around the country for the last couple of months. There might even be some left if you are lucky, though I doubt that very much. I really liked the Epic Coffee and Fig stout, it was 'different' enough to justify the $30NZ (about £15) I paid for it and I really enjoyed it. I have a strict Nothing Over $30 limit for bottles of beer. I'd likely adjust that to include Euros for a beer like that Epic/Epicurean. Sounds right up my alley. As for Oregon DIPAs, I'm bringing a tallboy can of Ft. George Vortex to EBBC. It's just a "regular" IPA but think you'll enjoy the can o' hops. I do love me a can of hops.